Even a Workflow system for improving productivity will become meaningless unless “Request” or “Registration” of the most upstream Step is made. The cloud-based Workflow, “Questetra BPM Suite”, has been corresponding to such as 1) Workflow start by a user in the system, 2) Automatic start triggered by “incoming email” from outside, 3) Automatic start triggered by an entry in a published Web form, 4) Automatic start triggered by “reception of standard HTTP request. 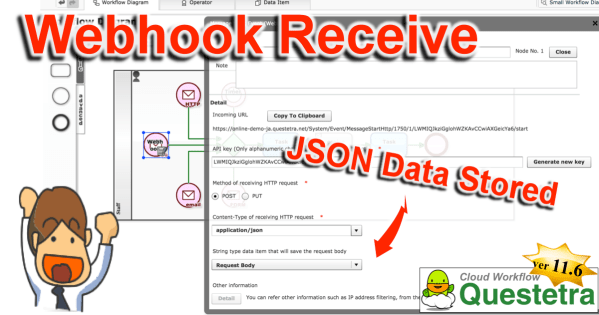 Since the new version 11.6, it becomes possible to automatically start the Workflow with the reception of “Webhook between servers” as a trigger. Specifically, it will be able to receive Webhook from “kintone”, a cloud database service, and “PayPal”, a payment service. With this feature, it becomes possible a collaboration, for example, which “Commodity registration flow” to the EC site is Started by adding products to “Product master” (kintone). Regarding Start Event and Catching Intermediated Event/Receive Task, a data receiving method that “To store the whole message body in a Data Item” becomes available in addition to “Storing values into respective Data Items as specified by parameter”. It is also possible to specify “Content-type” of the HTTP request to receive. Delegate/Return and Terminate/Delete become available on Smartphones. Also, a URL string entered in String type Data Item is automatically displayed as a hyperlink on a Process details screen. Regarding [Script Task] and [Service Task (Add-on)], it becomes capable of outputting logs to processing record using log output method. Also, error contents will be recorded automatically to processing log when an error occurs. An API for retrieving a list of Business Process Definitions (App), and one for activating (Release) the Developing version become available.